Scott Banton came through for his Savannah Cardinals, it's just that his runners didn't really cooperate, according to The Savannah Morning News. Banton came up in this June 1990 game with the bases loaded in the ninth, Savannah down by two. Baserunning mistakes left just a runner on third for Banton's single, The Morning News wrote. Instead of tying the game, The Morning News wrote, Banton's single still left Savannah down by one in a game they went on to lose. Banton was in his second season as a pro that year. He ended up getting into one more. He never made AA. Banton's career began in 1989, taken by the Cardinals in the 46th round of the draft out Virginia Commonwealth University. Banton started with the Cardinals at short-season Hamilton. The outfielder hit .219 over 66 games. He hit one home run and stole 16 bases. He moved to single-A Savannah for 1990. Over 106 games that year, he improved his average only a few points to .229. 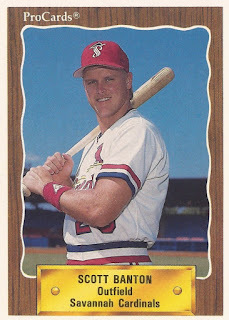 He hit two home runs that year and stole 14 bases. Banton played 1991 at single-A Springfield. His average there dropped. Over 82 games, he hit just .167. It was his final season as a pro.